Third Generation Owners at Hightower Funeral Home, Martin & Hightower Funeral Home and Hightower's Memorial Chapel and Cremation Serviceormation you need to make an informed decision about your loved one’s final resting place. Mr. H.B. Hightower began his funeral service career in 1926 at a funeral home in Bradenton, FL. From 1931 - 1937 he worked as an ambulance driver for Grady Hospital. In 1945, Mr. H.B. purchased Hoyt Kinney Funeral Home, a six room house, in Bremen. In1953, the funeral home moved across the street to the old hospital building. In 1960, the funeral home relocated to the present building on Gordon Street. Mr. Hightower's wife, Ruby, served as Secretary-Treasurer from 1945 - December 1976. In 1912, when J.C. "Mr. Cliff" Martin began his apprenticeship with J.N. Johnson in the funeral business, as most others in the U.S., operated from the back of a Carrollton general store. In 1923, he joined Kytle-Aycock who had a furniture store with funeral facilities in the back. Martin opened his own funeral home on July 15, 1928, going into business with his brother-in-law, the late Henry M. Almon. Martin & Almon Funeral Home was the first in West Georgia to operate not as a sideline to furniture, hardware or other store. After operating on the square for 13 years, Mr. Martin built the area's first structure designed exclusively as a funeral home on his wife, Eula Wiggins Martin's homeplace on West Center Street. He drew the building plans on a cardboard box and supervised the construction. "Mr.Cliff" also embalmed regularly for firms that sold caskets in a 30 to 40 mile radius of Carrollton. A 1916 graduate of Chattanooga's Eckels College of Embalming, Martin held Georgia License #536 and Tennessee License #450, both issued in 1916. His beloved wife, Eula, was one of Georgia's first lady attendants and performed all kinds of mortuary duties. One of those duties was to keep the pallbearers gloves freshly laundered. In 1953 Mr. Hightower bought Martin Funeral Home from Stewart and Cliff Martin. Both J.C. Martin and H.B. Hightower had sons who grew up in the funeral business and became the driving force for improvements as the business became more scientific and service oriented. Richard Hightower graduated from Bremen High School in 1955, West Georgia College in 1957and John A. Gupton College of Mortuary Science in Nashville, TN, in1958. He returned to Bremen to assist his father in constructing the area's most modern funeral facility in 1960. In 1974, he master minded a major remodeling and chapel addition to Martin & Hightower West Center Street location in Carrollton. Richard was a state and national leader in the development of funeral service. He was selected to the Academy of Graduate Embalmers and served on its board for 12 years. He is a past president of the Academy. He served on the Georgia State Board of Funeral Service from 1990 to 1998, has served on the Board of Directors of Independent Funeral Directors, and is past president of Associated Funeral Directors Service. "Mr. Cliff's" son, Stewart Martin, was a legend in his own time. After graduating from West Georgia College and Emory University with a degree in Biology, he attended Gupton-Jones College of Mortuary Science where he was a student instructor. He graduated in 1937 after having been an apprentice since childhood. When Stewart Martin began his funeral career in Carrollton, he also began an enviable record in Community Service. When elected mayor of Carrollton at the age of 26, he became the youngest mayor in the United States. 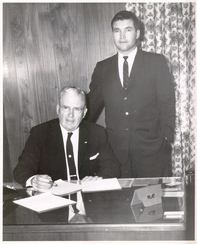 In addition, he was secretary of the City-County Hospital Authority from its inception to 1973. He was past treasurer of the Carrollton Housing Authority; chairman of the Carroll Service Council; member of the Carroll County Board of Tax Assessors; deacon of Tabernacle Baptist Church, and taught a radio Sunday School Class for almost 40 years. Stewart spoke as a lay minister at thousands of the services he conducted. As business increased and taxed the capacity of the West Center Street location, Richard built the Martin & Hightower Heritage Chapel on South Park Street in 1985. The West Center Street facility held its last services in 2005. In 1999, the Hightower family moved into the Douglasville community with the addition of Hightower's Memorial Chapel on Highway 78 in the former location of J. Cowan Whitley / Whitley-Garner Funeral Home. The Hightower family continues to maintain the level of professionalism, integrity, dignity and compassion that has been the hallmarks of Hightower Family Funeral Homes’ services throughout the past 8-plus decades. On any given day you will find the Hightower’s actively involved with the families and communities in the West Georgia area.